The year is pretty much any year time before 1854. The only way to the west coast of North America is still the long and dangerous voyage around Cape Horn. The only way? Maybe not, because people keep bringing up the possibility of a connection from the Atlantic to the Pacific to the north of Canada: the Northwest Passage. Many explorers set out to discover the Passage, and there was no one big success but multiple advances by different expeditions. The first to actually travel around the north of the North American continent was Robert McClure in 1854 who travelled most of the way by ship but had to resort to crossing an area of ice by sled in the end. The honor of the first purely naval traversal of the Passage goes to Norwegian polar explorer Roald Amundsen in his 1906 expedition. That’s how the history happened, at least, but in Northwest Passage Adventure, you have the chance to change it now. If you don’t mind a bit of fiddling with the paper tiles, that is, they are small and numerous and easy to push out of place. It’s not a huge issue, but if you are motorically challenged like yours truly, expect the other players to yell at you for “destroying the ocean, you monster!” You see what abuse I have to put up with? The Passage consists of stripes of four hexagonal fields that you put side by side to form the passage, augmented by two-hex pieces on the side depending on the number of players. 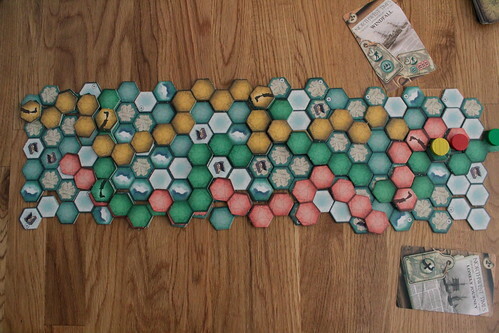 Like real explorers, you only see what’s right in front of you: initially, only four rows of tiles are placed, the rest is revealed one by one as players advance. You won’t see what’s coming, and you may find yourself stuck in a very inconvenient place between icebergs. Your goal is, of course, to reach the far end of the Passage with your expedition, to be found beyond row 24 because that’s when you run out of tiles. First to cross it wins. Travelling is a mostly straightforward affair: the four different terrains take a different number of action points to enter: one for water through, through land and snow up to icebergs at four points. Since you only get four points per turn, entering an iceberg is a costly way to advance, you’ll want to avoid it wherever you can. In another way, travelling is not as straightforward, though: to go anywhere, you have to cover your route for this turn with your advance tokens, tiles in your player color that have from one to four hexes in more or less useful shapes – think Tetris blocks, but made from hexes instead of squares. These tokens create the channel your expedition is travelling through, and you better make sure you have the right ones because you can only go where they take you – or spend a full turn recovering one of your used tiles, if you’re desperate enough. It’s actually one thing I disliked in Northwest Passage, no one ever had to make use of this options because you don’t run out of tokens. 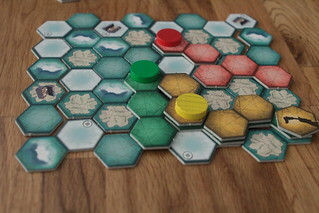 The more difficult part of handling the tokens is thus putting them on top of the terrain tiles without causing a major earthquake and tsunami, devastating the coast of Canada. But that might just be me with my fat fingers again. If players mark their advance with those tokens, then what does the next player do? The best route will already be taken. What is a poor explorer to do? That’s where the fun comes into this game, your opponents routes are not safe from you: for two action points, you can raid another players routes, entering the canal they created. Once inside, you may follow them for one action point per hex, no matter what the terrain used to be – they opened the way for you, all you have to do is set sails. The rules are unclear on how exactly you travel on an established route: do you still have to use your advance tokens or not? In light of having too many of those things anyway, we opted to use them, meaning you put another layer of tiles on top of your opponents layer of tiles, which is already on top of the terrain tiles. It’s actually not as bad as I make it sound, the game “board” doesn’t fall apart all that easily, and having those colourful routes crisscrossing on top of the terrain looks weirdly beautiful. With that big advantage of travelling in another players footsteps, are there any downsides to it? As a matter of fact, there are two, and number one is not a small one: only the first player to cross a treasure chest on the terrain gets to draw a treasure card. Those cards have some rather more and some rather less powerful effects, but having them is better than not having them anyway. Some have effects that are always awesome, like giving you an extra action point (two if you’re in last place). Others are more situational, allowing you to exchange to rows of terrain for instance, but only if there is nothing on top of them already. Which action cards you draw has a pretty big influence on your chances of victory, but they are all better than not having any, so you’ll want to get away from your opponents’ lee side sometimes. Reason number two why it’s dangerous behind another ship is that they may drop an iceberg in your way. For three action points, that’s a rather costly move, but it’s still one less than you have to pay to cross it, and done in tight place between more icebergs it’s an effective way to stop a follower. However, it’s a very situational move again that you won’t see every game. But in a game that you play in about thirty minutes, some situational moves and some required luck may be forgiven. Although some may argue about the “some” luck, between the treasure cards, your character card with its special ability and the unpredictable terrain, there are many random factors influencing your game. If you’re one of those people that want to plan everything with no surprises, then walk away while you still can. 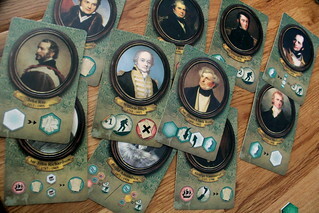 If “some” luck doesn’t bother you in a game that you’ll play with your family or between two meatier games with your gamer friends, then Northwest Passage Adventure is a quick and quirky game to pass some time.